Now kids, did I ever tell you the story of how Matt Wagner’s wonderful semi-autobiographical fantasy series changed my life? No? Well, it really didn’t… well, actually it did. Sort of. Better sit down, let me explain. No, no take the comfy chair. Here’s some nice hot tea. Don’t worry, I put a little spiced rum in it. Don’t tell mom. You see, I’ve always had this theory that most of what makes up the kind of person you are can be gleaned from three things. Everything else will work itself out in the wash, but your core is really what music you listen to, what movies you watch, and most importantly, what books you read. Ridiculous? Kind of. Shallow? Most definitely. Like I said it’s a theory. So let me just tell you this. 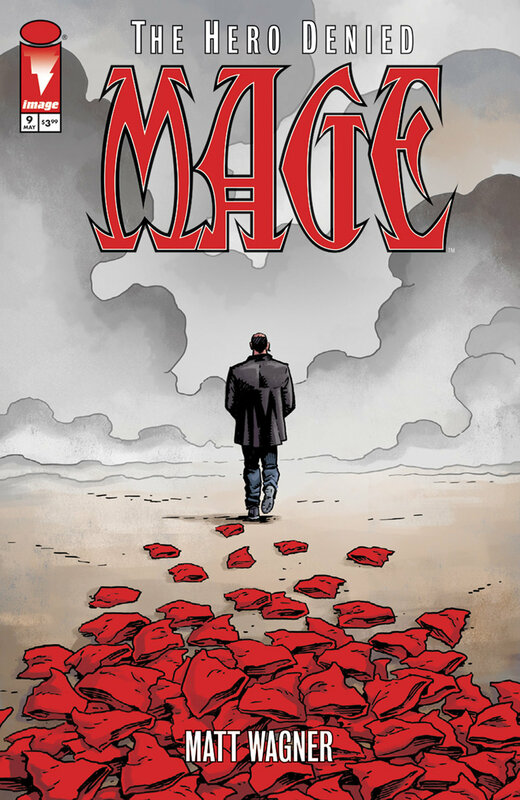 Mage: The Hero Denied #9 is smack in the middle of the last cycle of this story so it is not at all a good jumping on point for anyone not familiar with the adventures of Kevin Matchstick. For those of you wanting a plot summary, it’s more of Kevin’s search for his missing family. You can tell from the cover that The Red Caps get involved. Kevin’s sister-in-law is consulted and something really bad happens at the end of this chapter. Good enough? Cool. Now, for those of you not buying Mage on a regular basis, let me hip you to why you should. Mage started way back in 1984 as what eventually became a 15 issue mini-series from Comico. Back then there were several independent comics companies that consistently put out great reads. First Comics had a murderer’s row with Nexus, Badger, Grimjack and American Flagg. Dave Sim’s work on Cerebus was hitting its pinnacle with his Church and State storyline. Comico had Grendel, The Elementals, and Mage: The Hero Discovered. Comico went bankrupt in 1989 due to an ill-advised push into the newsstand distribution market, and the planned second series Mage: The Hero Defined didn’t emerge until 1997, after Wagner got the publication rights back. Since Wagner brought his Mage series to Image, they’ve done an excellent job of keeping everything in print with an unending supply of graphic novels. Mage, when taken as a whole, is a new spin on the King Arthur stories, shaken together with everything from William Shakespeare to Frazer and mixed liberally with Wagner’s clear solid lines and top-notch storytelling. It’s a check-in point of sorts so that Matt Wagner can drop by, eat all the biscuits, and let us know what he’s been up to the last decade or so. It altered my perception of what makes a good comic book story and helped me cultivate a lifelong love of comics that aren’t beholden to Marvel and DC. Mage is modern mythology writ large, wrapped up in a graphic storytelling package. It’s the best bits of Joseph Campbell and Michael Moorcock filtered through the lens of a master storyteller. It belongs on your shelf right next to your copies of Watchmen and The Dark Knight Returns. If you’re not reading this magnificent slice of graphic literature your life is worthless and empty and you should seriously consider buying two copies of each Mage graphic novel to make up for it. One for you and one for a friend that you really, really, really like.